Have you been to Club Amnesia­­­­­­­­­­­­­­? This is one of the finest hangouts that come to my mind whenever I think of partying. Strategically located at Plaza Building, Kampala Road, just near Space Lounge, Club Amnesia boasts of a good sound system with visual effects that give the ultimate clubbing experience. A variety of music, local and international, is played by famous DJs including Roja, Slick Stuart and Nimrod. Throughout the night we groove. Marion Ameso, the club manager, says their main clients are young people, especially those in higher institutions of learning. Some older and fun loving people also join in. Though the parking space is limited, this does not stop people from coming with their cars. Because of this, there is usually too much commotion with people struggling to find parking space. Fights are not uncommon here as denting cars is a common thing. Party people never mind this as long as the dance floor is enough and drinks are in plenty. This place is always a full house. One night I found here a heavily pregnant woman and I was amazed! Later I found out that one of her friends was going to premier a song and she had chosen to come along. Some women come here to “tight mark” their men and others enjoy this place simply because chances of hooking up with someone by the end of the night are pretty high. These club lights just make every one look gorgeous and absolutely stunning. 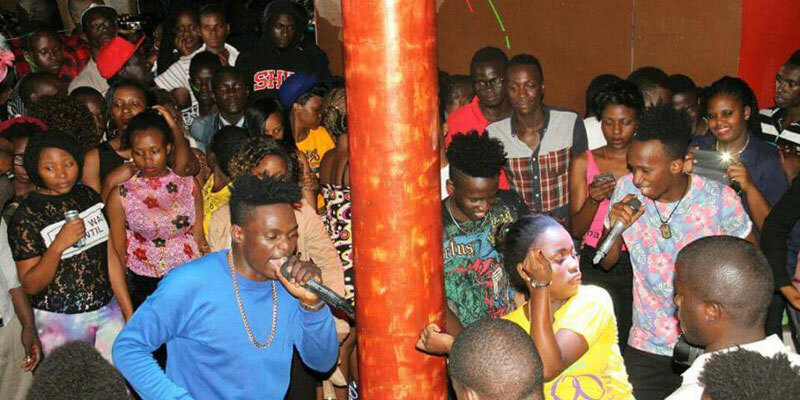 Club Amnesia offers some “visitation day” experience for the new comer. It is a common thing to see a young woman having a good time with a grey haired man. In our party language we call these men man-friends or Kidende. In common Luganda language use kidende means defiler. Each night has a totally different and fresh theme just to keep all of us hooked. Every Tuesday has a three hour session of Live band. Wednesday nights are dedicated to ladies and Thursdays are also Campus nights while Saturday comes with a unique theme party and targets mainly all fun loving adults. Ladies come dressed to kill – in skimpy dresses, pants, heels and all those other designer clothes. I actually only do pants because before I even think of wearing a skimpy dress I first think of the time I will be getting back home. Wee hours of the morning can be really chilly. People dance and sing along the music played. They empty bottle and glasses. In the late hours fights are rather normal and bouncers are busy. In the wee hours people begin to leave for home, most of them totally drunk. The minority have cars. For most of us, it is boda-boda!